The relationship between Film Sense and Kurt J. Lesker dates back to almost the inception of Film Sense. In fact, the first Film Sense FS-1 in-situ testing was performed on a Kurt J. Lesker ALD150LX reactor in 2014. 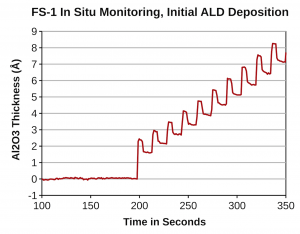 The FS-1 has since been integrated on multiple Lesker ALD reactors, and has been used to characterize a wide variety of thin films including: Al2O3, TiO2, HfO2, and TiN. The ALD150LX was designed from the ground up for advanced R&D and features remote plasma as well as in-situ ellipsometry as a primary means of real time process monitoring and control during ALD. Patented Precursor Focusing TechnologyTM (PFTTM) prevents unwanted film deposition on sensitive surfaces inside the reactor including the analytical port windows used for light transmission during in-situ ellipsometry. The layout of the plasma-enhanced ALD (PEALD) reactor makes installation and operation of the compact FS-1 unit simple and easy. According to Bruce Rayner, Principal Scientist – ALD at the Kurt J. Lesker Company, “The FS-1 provides excellent performance at a very attractive price, and its robust, compact design is ideally suited for in-situ ALD applications”. 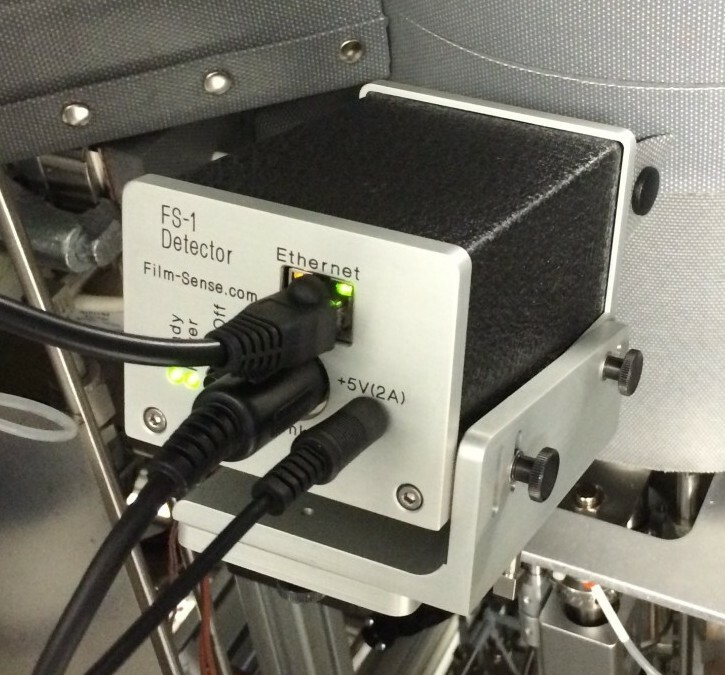 The Film Sense vision “to create easy-to-use and affordable ellipsometers” is especially relevant for in-situ applications. The Film Sense FS-1 realizes this vision by providing the power of Multi-Wavelength Ellipsometry, at an affordable price and compact size that is ideal for in-situ measurements. 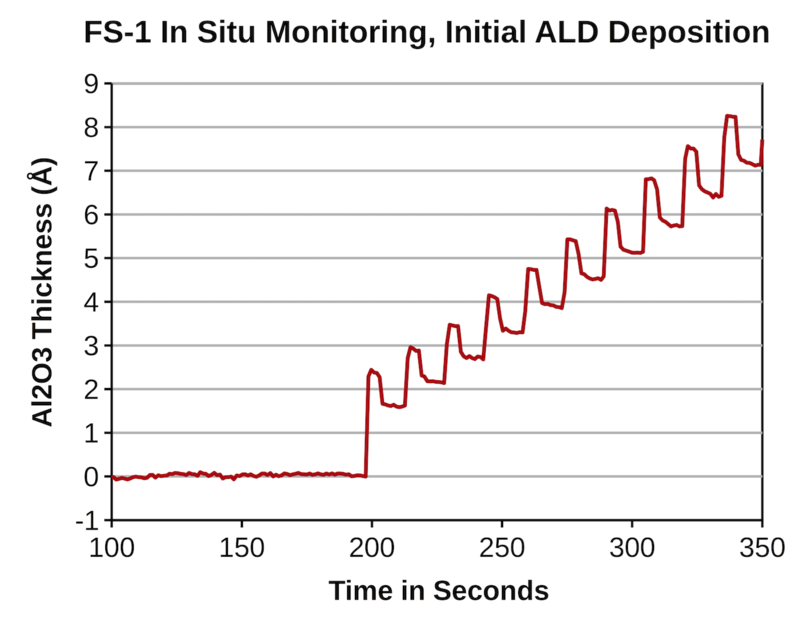 The FS-1 can provide real time thickness data with exceptional precision, which can be indispensable for the efficient development of new ALD processes. In the plot below, the “steps” in the data are direct observations of the thickness changes on the sample throughout the ALD cycles: the thickness increases and saturates as the precursor is introduced (trimethyl aluminum in this case), and then decreases as the film is oxidized (thermally by H2O in this case). The Film Sense FS-1 ellipsometer is now available as an option for the Lesker ALD150LX reactor. For more information about the Film Sense FS-1 ellipsometer, please contact Dan Hadwiger. To learn more about the Lesker ALD150LX reactor contact Noel O’Toole or visit the Lesker website.